Tem chovido tanto por Lisboa utlimamente que tem sido impossível tirar fotos de looks com uma luz tão cinzenta todo o dia. Sou uma grande fã de preto, e estou apaixonada por estas botas over the knee. Sei que muitas pessoas não gostam de ver, mas acho que bem conjugado fica muito actual. A capa é uma das minhas recentes compras e gostei muito de a ver com estas botas. O que vocês acham? In Lisbon, it has rained so much lately, that it has been impossible to take pictures of looks with such grey light all day. I'm a big fan of black, and I'm in love with these over the knee boots. I know many people don't like to see this kind of boots, but I'm in love with this trend. The cape is one of my recent purchases and I really liked to see it with these boots. What do you think? So chic! Loving the cape! You look gorgeous! In love with that cape!! Perfect look girl. Love the effortless chic look here. Awesome hat. A capa é linda - gostei do conjunto! I love rainy days and your outfit!! Fotos fantásticas, gosto do look. 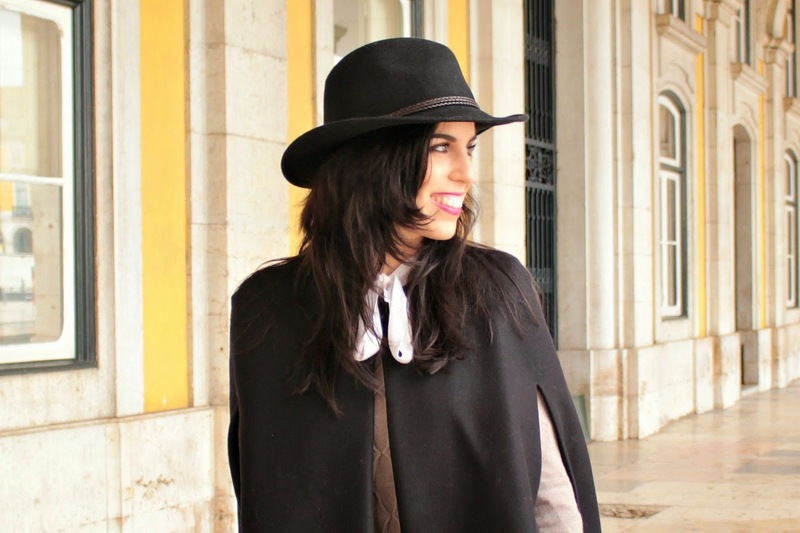 Também fiz um post sobre Lisboa juntamente com uma amiga que mora ai. LOVE the cap! Such a great trend and you wear it very well. You look great in a hat. Thanks so much for stopping by! Wow I love your outfit! It's chic & modern at the same time!